Some Pens I’ll Be Uploading To The Sales Site Soon. Here are some of the pens I’ll be uploading to the sales site in the next few days (Deo volente). I would like to write about all of them in much greater detail but I just don’t have the time. There are a number of others that I have written about already. This one’s a sturdy Valentine which bears some resemblance to the 1947 Parker Victory Mark III so it’s doubtless of a similar date. I’m not usually fond of Valentines; most of those I come across are flimsy, fragile things but this one is the opposite. The De La Rue pen is a close relative of the Onoto and this one sports a number 22 nib which is fitted to some of the Onotos as well. The handsome mottled hard rubber section is correct; it’s a feature of these pens. The jade cap lip on this American Swan ringtop is very distinctive; a very rare pen. Another of those splendid Italian marble Swans. I’ve been very lucky in picking up several this past year. This one’s an SM 100/59. A fine old Swan safety screw cap. A little faded, but sound and bearing an accommodation clip. A superb Conway Stewart 479M, the Universal pen. This is the earliest version, dating to around 1931, identified by the inserted clip, flange lever and domed top. The colours of the mottled hard rubber are very rich. A very fresh Cross in matte black with a broad stub nib. This is a Blackbird Self-Filling Pen of the earliest type with the spoon feed, soon to be abandoned in favour of the ladder feed. The embossed gold-plated broad band is very attractive. This Mabie Todd “The Swan Pen” is around 100 years old and still working splendidly with its over-and-under feed, New York nib and slip cap. This one is an oddity: a Pilot with a “fude” nib, intended for writing Chinese characters. The more you angle the pen the wider the line becomes. “Rosemary – that’s for remembrance”, a beautiful lever filler made for National Security to commemorate those lost in the Great War. In excellent condition, bearing a hallmarked broad cap ring. This boxed Excelsior is New Old Stock. Interestingly, it’s an accordion filler. A most uncommon pen here in Britain. An excellent Parker 61 of the capillary type. It has been thoroughly flushed out and is ready to write. The box is in first class condition and filling instructions are included. 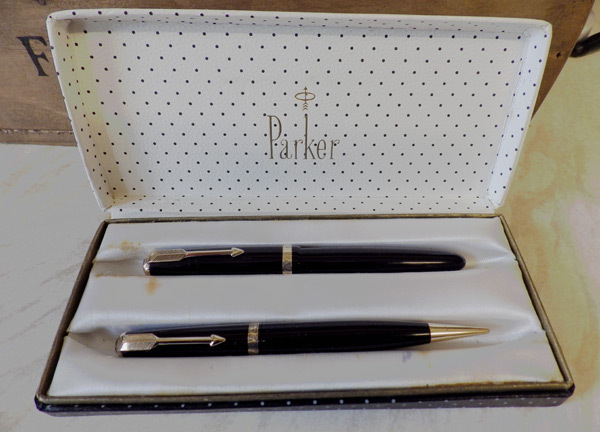 A Parker Aerometric pen and pencil set. There is some staining on the interior of the box but it’s otherwise sound. Oh dear Deb. You are a lady full of pleasant surprises. There’s always something new coming along (even if it’s quite old!). The De La Rue pen does look quite nice. They write well too, those pens. Could you please put aside “The Swan Pen” with over/under feed and the Rosemary for me. Let me know what I owe you with postage to Cairns Australia please. As I have said in previous posts, I cannot set aside pens for anyone if I have posted them here in the blog. It’s one thing if someone contacts me to ask me to be on the lookout for a specific type of pen, but once I have posted about pens here, there are often quite a few people who wish to purchase them. To choose one customer over another is not a fair way to do business. So I cannot put pens aside for you – they will be uploaded in due course, and as always I will post here as well as on Facebook and in some other pen groups once the upload is finished.